I'm going to start my review by saying that this is one of those books that you really need to read for yourself, don't necessarily trust the reviews (positive or negative). Obviously my review it going to be positive, but I've seen many negative and DNF reviews for this book. I adored Rossi's Under the Never Sky trilogy, and I thought her New Adult contemporary romance series (under Noelle August) was just okay. 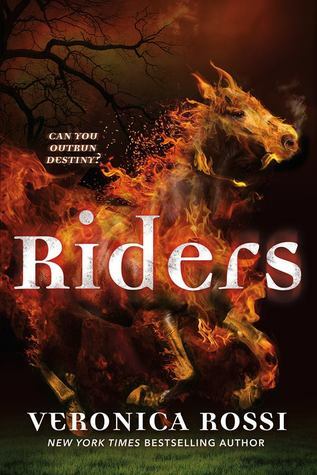 I've had Riders for months, but I put off reading it until February, upon the publisher's request. I personally think it was well worth the wait! By now, I've seen a mix of reviews, but I managed to evade the specifics and form my own opinion. I encourage anyone interested in this book to do the same! This book is written backwards - Gideon is telling a federal agent what happened, so the story is being told to us. We know that Gideon is drugged and held in a prison at an unknown location, and that he has been separated from three males and one female that he had been with, in Norway. We know that he is one of the four Horsemen, and that they was protecting something incredibly important, but everything went wrong. Gideon must tell his story in hopes of the agent believing him and letting him go - but it's not as simple as all that. I don't usually like books that are written such that the story is being told back to us, in which a character is in the present and telling us the past. However, I think this type of storytelling worked, in this book. I think a lot of people struggled with this, especially in the beginning, but I think Rossi did a really good job of crafting the story with this uncommon way of sharing the story. I adore Gideon. He's got a temper, he's a tough guy, he's a hard worker, he's got a serious case of OCPD, and he's a good person. He has so many layers - I love how thoroughly and deeply Rossi digs into his character. He has so much baggage from his past that is weighing him down, and part of his journey throughout this book is coming to terms with the baggage. This book is told exclusively in Gideon's first-person POV, and I love this change of pace (compared to most YA novels). Just Gideon in first-person, no one else. Gideon has an interesting and hilarious voice. He's sarcastic and yet direct, commanding and sometimes harsh. He has a military mindset, with the precision and the commands and the physical and mental strength. Gideon is War, hence the temper. 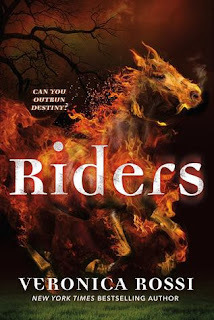 Throughout the book, he and Daryn (a girl who shows up needing his help) search for the other three Horsemen. There is Sebastian, who is Famine. He is talkative and excitable, and the joker of the group. Marcus is Death, and he is hardened and almost unfeeling. He and Gideon do NOT get along (but they are so similar). And finally, there is Jode, who is Conquest. He's a "pretty boy", rich and cultured and polished. Together, the group must work together to help Daryn and protect the mysterious THING that the bad guys are looking for. There is romance in this book, and there is NO love triangle/square/pyramid/pentagon/anything of the sort. It's a linear romance, and a slow-burn one, and not an easy one. I loved watching Gideon and Darryn fall for each other, but Darryn pulls away from Gideon constantly (for good reason, unfortunately), and I just wanted to smoosh their heads together! The romance is pretty minimized, though it is there. I think it might be a tiny bit more present in the next book, but I like that it isn't the main emphasis of the story. Not by far. I won't say much more on the plot, but I will say that the story starts very slowly. I remember reaching the fifty-page mark and losing interest a little. But if you power past the 100-page mark, you'll be fine. The story took off around page 120 ish, and I couldn't stop reading. I loved seeing Gideon's character development, the small progressions in his relationship with Darryn, as well as how the four boys work together. The bad guys - demons - were a strange bunch, as was the world-building of this book. Still, I like what Rossi has going on here. Overall, you can probably tell that I liked this book. Maybe not as much as I'd liked the Under the Never Sky series, but this new Rossi book didn't disappoint me at all! I can't wait to read the next book in the series. Like I said above, the beginning of this book is SO slow. I actually wasn't getting into the book and wanted to push it back (for the forty billionth time), but I wasn't feeling it. It took me about 150 pages before I really started flying through the pages. So, be aware of that. This book is set in the modern world, but obviously it's got tons of fantasy elements. If you're a fan, give it a try! This book isn't stuffed with religion (though there are Biblical references), and it also isn't consumed by romance. Gideon is a likable and noble hero, and I wouldn't mind reading more from his POV! Book two, here I come! 4 stars. I'm so glad I kept reading, and that I didn't get deterred by negative reviews. I wasn't likely to get deterred, since I got this one from the publisher and I've had it for review for months, but it's disheartening to see people dislike a book that you've been dying to read for years. I'm glad it didn't disappoint me! I'm excited for the sequel! No need to be worried! I was pretty happy with this one overall. Gideon needs all the tackle-hugs! I'm glad you liked it ! Great review :) I was wondering if this would be a good book (mainly indeed because of some negative reviews) but knowing it will get better makes me want to pick it up when it comes out :) Thanks ! It got better as it went along! It took me some time to get used to the way the story was told, as well as to get into the story in general, but I'm glad I stuck with it. Thank YOU, Melissa! It does sound like a story that can go either way, but I'll keep in mind that it gets off to a slow start and tells things in a looking back fashion. It was very different, the way the story is told! Took me a bit to get used to it, but I grew to like it! Ha! I did! I'm glad I wasn't disappointed as well. :D Thank you, Carina! I will try this book and see ! I really liked this book! Not as much as UTNS, but I found it really great! I'm so glad you enjoyed it! And I agree, it turns better if you keep reading! YAY! So happy to see that you're invested! Definitely pick up a copy when you get the chance, ASAP. Thanks for mentioning the slow start. I'll keep that in mind while reading. Great review! I have been excited to get my hands on Riders. I really liked Rossi's other series. It makes me so happy to hear that you enjoyed it! A book with that awesome of a cover has to be a great read! Man, I really need to check out Veronica Rossi soon! That's too bad that there's been so many DNF reviews, but I'm totally loving the sound of this book! Gideon sounds awesome and the romance sounds perfect! I'm glad you enjoyed this so much! You should! Her Under the Never Sky series is really good, and this one was great too. I personally adored this book, but you can tell from Goodreads that opinions are mixed. But what can you do? Honestly, I haven't read Rossi's other series... it just didn't interest me at all, but I will say that the synopsis of this book caught my attention a little more. I definitely want to check it out because it sounds a little different, I'm glad for the advice of checking it out for myself since there are such varying reviews on it. Thanks for the great review! I think, of the two series, the Under Never Sky series is better, but I loved Riders, so it's a pretty close call. Thank you, Andrea! This one really has had mixed reviews from what's shown in my feed. It sounds interesting though and I love that cover! Ohh Yay!!!!! Awesome review Alyssa! I am so glad and happy you really like this book. I was a bit hesitant to check it out because of the mix reviews. But after reading your review (which I completely trust) I just know I am going to really love and enjoyed this one as well! Thank you for the awesome post my friend. I'll look out for your opinion on the book, Katiria! It publishes on Tuesday!